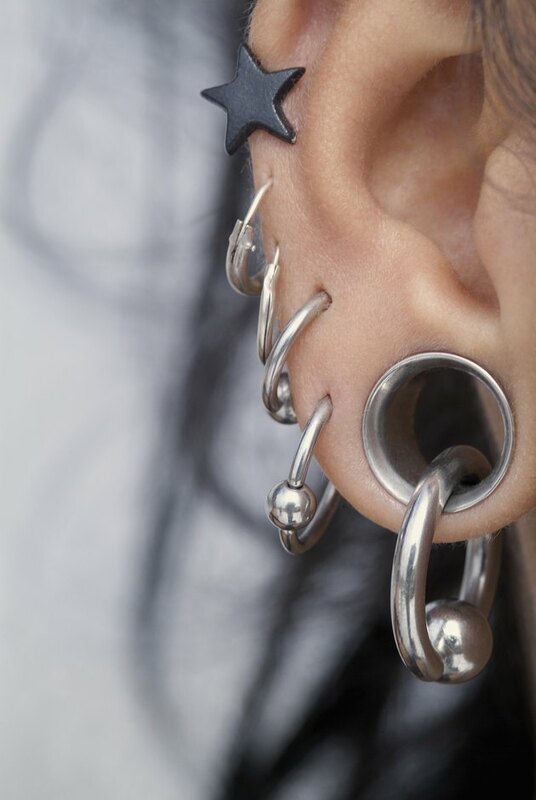 Ear piercings are one of the most common types of body piercings; they are also considered to be one of the safest types. However, just like any other piercing, they come with risks. Seeking a licensed professional to pierce your ears is the best way to avoid the risks of infection and allergic reaction. A bacterial infection can result from the use of dirty needles during the piercing process. Make sure that the professional who is piercing your ears uses clean, sterilized needles, and avoid touching the new piercing. Follow the piercing professional's instructions for careful cleansing and care after piercing. This may include using antibacterial products and washing your hands beforehand. Piercing also brings the risk of developing an abscess; this occurs when pus becomes trapped under the skin, just above the cartilage. Antibiotics can be prescribed to help with this type of infection; in severe cases, surgery may be required. The use of unclean needles can also lead to transmission of HIV or hepatitis. Sometimes the type of jewelry worn in a new piercing can cause allergic reactions on the skin. A safe bet is to avoid earrings made of nickel or brass, to which allergic reactions are common. What Size Gauge Is an Ear Piercing Gun?